Serial Liar Bill O’Reilly Of Fox News Advises Trump To Stop Lying – No Really! In the latest episode of Bill O’Reilly’s “Talking Points Memo” (video below), the Fox News host tackled a serious issue. Monday’s House Intelligence Committee hearing on Russia’s interference with the 2016 presidential election was the subject. However, O’Reilly’s focus, like most Republicans, was more on White House leakers than on Donald Trump’s allegedly treasonous behavior. O’Reilly began by whitewashing Trump’s association with unsavory figures like Roger Stone and Paul Manafort. Stone is a long-time associate of Trump’s and Manafort was his campaign chairman. Both have disturbing connections to the unfolding Russian intrigue. But according to O’Reilly, they were merely incidentally associated with Trump. In fact, O’Reilly parroted Trump’s press secretary, Sean Spicer (Fibby Spice) who also downplayed those relationships. That’s a deceptively significant statement. First of all, it presupposes that this president doesn’t already embrace only facts. Of course, most clear minded observers are well aware that Trump is a pathological liar. But for a close personal friend like O’Reilly to concede that point is itself newsworthy. 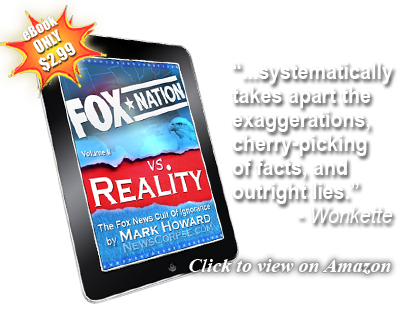 You have to wonder what other pronouncements of Trump’s O’Reilly believes are not factual. He certainly has never made a point of criticizing Trump’s honesty before this. With regard to the congressional hearings on Russia, O’Reilly managed to lie in the introduction of his first guest. In a summary of the hearings he said that FBI Director James Comey “couldn’t confirm an investigation” of Trump’s connections to Russia. But that is exactly what Comey did confirm at the outset of his testimony. 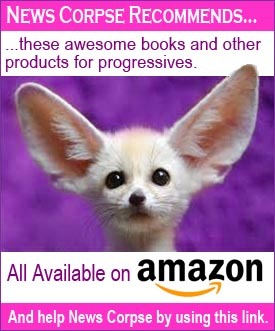 Additionally, O’Reilly never mentioned that it was his colleague, Andrew Napolitano, who provided Trump with the phony allegations that Obama employed British spies to surveil The Donald. On Monday Fox News reportedly put Napolitano on an indefinite leave. That also went unmentioned. O’Reilly exhibited little interest in the Russia story. He was far more concerned with finding and punishing leakers. That’s like having your neighbor tell you there’s a dead body in your backyard, but then only questioning him about how he found out. O’Reilly went even further to say that “These leakers, they gotta be arrested. And we’re gonna deal with whether the press should be arrested too.” So it’s not enough that O’Reilly is a lying, flunky for Trump and his Russian pals. He’s also intent on imprisoning journalists and abolishing the First Amendment. A buffoon telling an idiot what to do. I love my country but I am totally against the right wing nuts who are trying to ruin it. It’s pathetic spectacle. And we need to stop it. Of course, what O’Lielly means when he exhorts Trump to “embrace only facts in his pronouncements,” he of course means only O’Lielly’s facts. But since he never has any…. Still, you have to admit it is very interesting to watch a pathological liar advise another pathological liar. Liar, liar, pants on fire! I’m surprised O’liar has any pants left to burn. He’s the one who should be removed from the airwaves of any kind. Permanently. 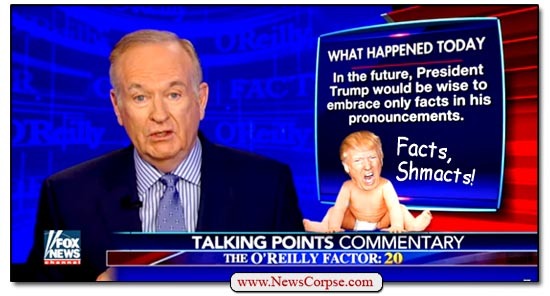 O’Lielly never saw the irony in his ever present chryon saying “THE O’REILLY FACTOR: 20,” which of course can only stand for the number of lies he told in the last five minutes. Speaking of which, O’Lielly, that really isn’t something to brag about….